I’ve spent much of the last two decades chasing tarpon all over Florida and the Caribbean. I’ve never kept a running tally but my anglers have boated hundreds of tarpon since I started guiding. In that time I’ve learned a lot about how to hook and land (and often lose) these great game fish. But more importantly, I’ve learned a lot about how to handle and release them safely back into the water. Tarpon are the best example of a fish that is too valuable to be caught only once. They are a restricted species in Florida since they are inedible but also a huge source of tourism dollars to the state. A $50 tag is required for anyone who wants to kill a tarpon for a possible world record and only a fraction of those sold are actually turned in each year. Even though I have nothing against record hunters, I’ve never purchased a kill tag and insist on releasing every tarpon caught on my charters. My wife's first tarpon. It swam away just fine but holding them like this is not the best idea. For most of my anglers these are the fish of a lifetime so it’s just as important that we get a good photograph before sending them back to the water. That used to mean sticking a gaff through the tarpon’s lower jaw and hauling it up onto the deck of my skiff. This might have made for an impressive picture but it could also make for an even more impressive mess. Tarpon are covered with a thick, mucus like slime which sticks to everything they touch and makes the boat slippery as hell. To make matters worse, these fish have a nasty habit of emptying their bowels if you let them flop around on the deck or put any kind of pressure on their belly. It’s an understandable reaction to a stressful situation. You’d probably do the same thing if the roles were reversed. This mess came from a small fish. You don't want to see how much a 150 pounder can produce. More than once I’ve found myself holding a struggling tarpon in a headlock while covered in a lovely mixture of slime, poop, and saltwater, waiting patiently for my angler to show his wife how to turn on their new camera. Trust me on this one; it tends to spoil the moment just a little bit when the sun starts baking that stuff into your leg hairs. Worst of all you’re doing the tarpon no favors at this point and drastically reducing its chances of survival. Gaffing and lifting them by the lower jaw is a terrible practice and I have not done it to a fish in a long time. A full grown tarpon can swallow a bowling ball but their jawbone was not designed to support a hundred pounds of weight. Even if you don’t lift them, the hole that a gaff creates is an open wound that can lead to infection or worse. 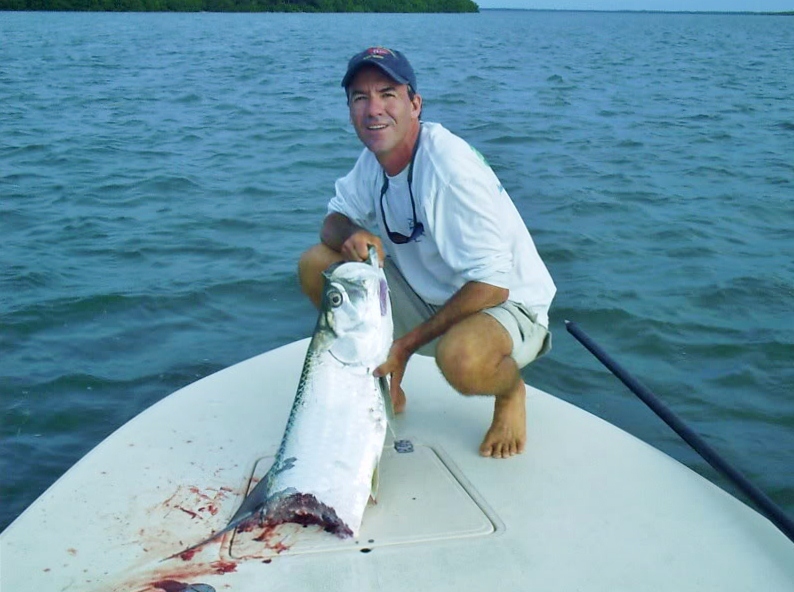 Finally, the tarpon you’re holding and photographing in your lap just put up a fight worthy of an Olympic decathlete. On average they jump, run, pull, and surge for up to an hour in very warm, shark infested water. Put yourself in the tarpon’s fins and you’ll realize that pulling one out of the water is like crossing the finish line at the Chicago Marathon, having your head dunked under a tub of Gatorade while ESPN interviews your trainer, and then being made to walk back home through Cabrini Green. Chances are it won’t end well. This really did not end well. These days, if one of my anglers catches a tarpon over twenty pounds the fish stays in the water. I quickly pop the hook out of its jaw if possible or cut the leader if it’s set too deeply. I only use non-stainless Owner hooks and they corrode quickly. You can still hold the tarpon by the lower jaw and get your face next to theirs for an impressive photo. After that it’s time to put the boat in gear and move the fish through the water until they’re fully revived. After a long fight this can take more time than most anglers realize, sometimes over fifteen to twenty minutes. But it’s important to keep them moving until they kick away under their own power. Watching a tarpon swim away healthy is worth much more than any photo you’ll ever take. And coming back home not covered in slime and poop is priceless. The best way to handle and photograph a tarpon.